Thank you for Supporting the Western Libraries Student Employee Opportunity Fund! Western Libraries recently established a special fund to support student professional development and scholarship opportunities. Student employees are integral to the successful fulfillment of Western Libraries' teaching and learning mission, and your generous support helps fund registration fees, travel expenses and other associated costs for students who participate in conferences and research opportunities that advance the Libraries' teaching and learning mission. Whether through providing research and writing assistance in the Hacherl Research & Writing Studio, dialogue facilitation in the Teaching-Learning Academy (TLA), or by sharing their energy, expertise and insights in the day-to-day activities that help the Libraries function effectively, the contributions and dedication of library student employees are essential to the successful advancement of Western Libraries' mission. In addition to their daily work, some students also engage in professional development and research activities, which may include presentations at national and international conferences. For example, as part of their first year as assistants in the Hacherl Research & Writing Studio, student employees develop a research topic related to Studio scholarship and practice, which they later share in the form of “legacy projects.” Every year, a number of studio assistants present their findings at conferences like the National Conference on Peer Tutoring in Writing (NCPTW). 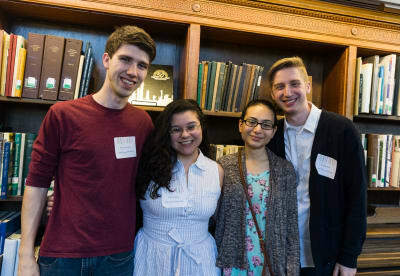 Former library student employees who have benefited from these opportunities recount how much they appreciated the chance to engage in research and scholarship as part of their integrated employment and education experience. Students find value and enrichment in professional development opportunities which help them prepare for graduate school or enhance their employment prospects. Likewise, student research informs and enriches the Libraries' daily practices, and their scholarship advances the field of teaching and learning. Western Libraries relies on the generosity of our donors to make these life-changing opportunities possible. On June 1st, WWU's 2nd Annual Western Give Day, a portion of EVERY gift made will be matched! We hope you will consider taking advantage of the fantastic opportunity!